Bluecoats' fourth-year front ensemble member Craig Loeffler talks about his shining moment on last year's ESPN2 broadcast, the success of Bluecoats season to date and what to look for in the corps' 2006 program, "connexus." Twenty-one-year-old Loeffler is a native of St. Charles, Mo. This interview was taken following the Bluecoats' performance at the 2006 DCI Columbia event in Columbia, Mo., on June 24. 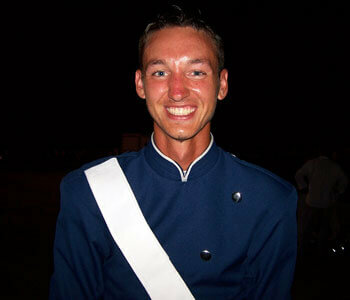 More interviews like this are available exclusively to members of the DCI Season Pass.